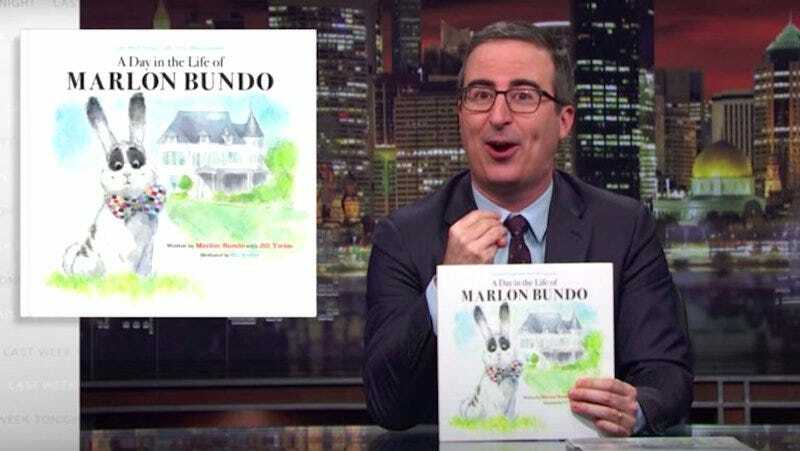 John Oliver announced on Sunday’s episode of “Last Week Tonight” that he’d published a parody of a children’s book that the family of Vice President Mike Pence released on Monday. On Sunday’s episode of “Last Week Tonight,” John Oliver announced that he’d published a parody of the children’s book the family of Vice President Mike Pence released on Monday about Pence’s pet rabbit. Pence’s book, titled “Marlon Bundo’s Day in the Life of the Vice President,” is written by Pence’s daughter Charlotte Pence and illustrated by second lady Karen Pence, and it depicts the Pence’s White House pet rabbit. “It turns out, in a complete coincidence, we also wrote a book about Mike Pence’s rabbit that has also been published,” Oliver said. Oliver’s parody book, published by Chronicle Books, is instead about a “Very Special boy bunny who falls in love with another boy bunny,” according to the book’s description on Amazon. The “Last Week Tonight” host noted that Pence’s book tour for his children’s book includes a stop in Colorado at the Focus on the Family organisation, which Oliver said promotes gay-conversion therapy.